Dr Alina Congreve from the Harlow Art Trust writes on public art since 1945. Before 1945 buildings were adorned with decorative sculptures and public squares had monuments and memorials. But public art as we now recognize it did not exist. What art we choose to put in public places reflects the values of society at the time. The recognition that very few memorials mark the contribution of women has led to efforts to redress this imbalance with new commissions. In 2018 Millicent Fawcett took her place in parliament square. Women artists and makers took a central role in the creative and design process. Our public spaces are now marked by permanent and temporary works of art that are far more varied in their materials, subject matter and ways they engage with the public. This change from memorials and decoration to much more diverse and varied public art began after 1945. This was a period of huge social change. Arts that were previously the preserve of a wealthy elite were opened up to ordinary working people. This change was felt most strongly in the environments built from scratch after the war: town centres destroyed by bombing; new Universities; and post-war new towns. Theatres were built with ambitious and creative programming. Before the war modern art, like the theatre had been a niche interest of the wealthy. Masterplanners of these new environments bought and commissioned modern art and made it part of people’s everyday lives. Sculptures and murals in a modern style were placed in town centres, schools, neighbourhood centres and residential neighbourhoods. This initiative by masterplanners could be narrowly defined as paternalism. There are certainly some common elements with those who founded the BBC in wanting to shape and ‘improve’ public taste. However, a story based on a paternalistic state providing homes, shops, schools and art downplays the active role that residents took in building and shaping these new places. Public art is more than putting a piece of sculpture outdoors. It speaks to public concerns in our neighbourhoods, towns and country. The optimism and idealism of postwar urban planning is prominent in the public art. 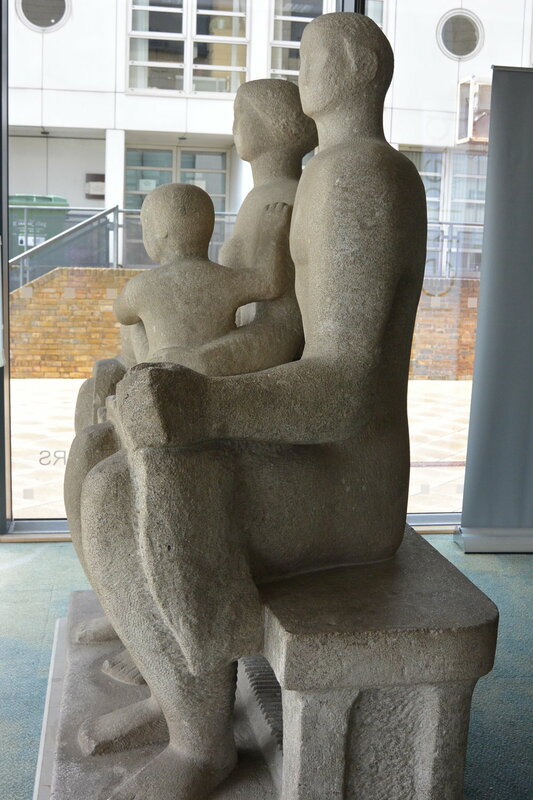 Family life is another prominent theme, exemplified by Henry Moore’s Family Group sculpture in bronze for the Barclay School in Stevenage and in stone for Harlow. The subject matter of Family group helped to soften and gain wider acceptance for Moore’s art, which at the time was widely regarded as controversial. The way in which public art speaks to public values has been well illustrated by the art supported through the World War One project 14-18 NOW. The poppies at the tower of London by Cummins and Piper, Pentagram’s Dazzle and Danny Boyle’s sand portraits have helped us commemorate, reflect on and connect with events 100 years ago. The values that underpinned postwar planning fell from fashion. In the arts, tastes became increasingly influenced by American popular culture and consumerism. However, a new generation is again recognizing the value of the postwar planning project and the values that underpin it. Students of urban planning, conservation and architecture come to these environments with fresh eyes, and without some of the negative preconceptions that affect their parents generation. The challenge will be to hold on to these values in their own professional practice and create new urban environments using modern techniques and materials. Dr Alina Congreve is an urban planning professional and Trustee of the Harlow Art Trust. The views expressed in the blog are her own.